raison-d'etre is its World Champions. The many kickboxing competitors from across the globe that have competed with the best of the best to earn the title of World Champion. They wear their achievement proudly via their Gold medal. The W.K.C. also awards its own unique Gold Star to all of its world champions to wear when out of the training hall to show the martial arts world They are world champion gold medallists. The W.K.C. World Champions Gold Star is for individual achievement only. It not about how many Gold Medals a competitor has won. Only one Gold Star is presented to a Gold Medal Winner each year. 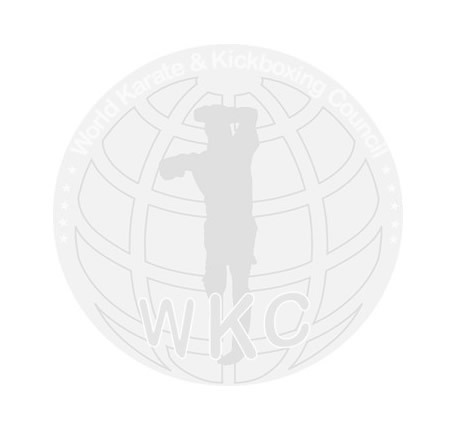 World Karate & Kickboxing Council. The W.K.C. selects a world champion annually in each category; the process for this selection is called competition. Only by hard work and effort can you the competitor Achieve the ultimate goal of becoming a world champion. In your martial arts study and training do not be afraid of making mistakes. When you don抰 know, ask questions, for with the right knowledge you will know how to perfect the right technique. We are all individuals so do not attempt to become a copy of another. Create your moment, seize the opportunity, and aim for the top.